Not to be confused with Wine & Chef on the next street, The Wine & Gourmet Friends at Bukit Pasoh Road serves modern Asian cuisine with thoughtful wine pairing recommendations. Opened in September 2018, the 56-seater features a contemporary, minimalistic décor with wide wooden tables and sensible fabric upholstery. Perfect for a cosy gathering or unwind after a day’s work. The premise also boasts a walk-in wine-cellar which holds 300 different styles of wine, with 80% of these being exclusive to The Wine & Gourmet Friends. What I fancy about this Asian-tapas wine bistro is the fact that it is established by a group of friends. Each of them is a co-owner and they bring along their specialization to the table. One of the owners is resident wine guru William Seah. Affable and knowledgeable on the wine trade, he shared with us the proper way to drink wine, the various wines provenance and the usage of the Aerating Decanter. As a host he buzzed around table to table, while Chef Wilson Ang and Pastry Chef Gus Wang, also partners in crime, worked behind the open kitchen like clockwork. The Prawn & Seafood Bite (Hei Zou) ($12) is paired with Torre Orientale Friuli Grave DOC Pinot Grigio ($35). Not the crunchy type normally expected from the Zi Char stall, the skin is soft and wafer-thin. The emphasis, however, is on the filling. The minced pork belly-and-prawns is tender, meaty and has a nice bite to it. The Asian-fusion Foie Gras Lotus Leaf Rice ($18) is paired with SUN & AIR Coastal Region Merlot ($29). Hidden beneath the mound of lotus chips lies a perfectly seasoned and seared foie gras which luscious buttery taste cleverly balances the more subtle and earthy lotus leaf rice. There’s also a nice contrast of textures between the crispy lotus hips and the creamy foie gras and the fluffy lotus rice. The medium-bodied Merlot pairs nicely with the richly textured foie gras without being too cloying. As a true-blue Singaporean, I can’t help but ask where’s my rice for the Roast Pork Belly ($24). Visually, the pork belly looks rather lonely on the plate, although flavour-wise the meat is on point and can stand on its own. Possessing a full-bodied taste, it is thankfully not salty but savory. The meat-fat ratio is evenly distributed and the thick, crispy crackling skin is a clear winner. The visually-appetising Lamb Trio ($30) consists of a lamb kofta, lamb rendang and rosemary grilled lamb rack. Of the three, the lamb kofta packs a meatier, more flavourful punch in the spice section. The Blue Pyrenees Estate ($58) provides a relief to the carnivorous indulgence; its lingering freshness of red berries and cranberries cuts through heaviness of the two meat dishes. The Black Pepper Crab Noodle ($18) is an interpretation of the cze char favourite, minus the need to strenuously de-shell the crab. Featuring a plump soft-shell crab and nutty wholegrain noodles drenched with rich seafood broth, the noodles is a delight to slurp and made al-dente. Though I find the dish somewhat heavy in richness, for the working bees around this would be a substantial dinner. For desserts the Goreng Pisang ($12) or the banana fritter is supposed to be the lead here, but the banana kueh with dark chocolate ice cream captures our attention. The chewy and mellow sweet kueh balances surprisingly well with the creamy ice cream. The dessert wine San Maurizio Brachetto ($29) possesses a nectarine sweetness like happy sunshine glowing on the palate and senses. Shaped like the King of Fruits, our second dessert is the intricately crafted Durian Bomb ($14). What you see is what you get. The durian bomb tastes exactly like how durian is supposed to taste like – pungent, rich and creamy –and much cuter. Very Instagrammable too. 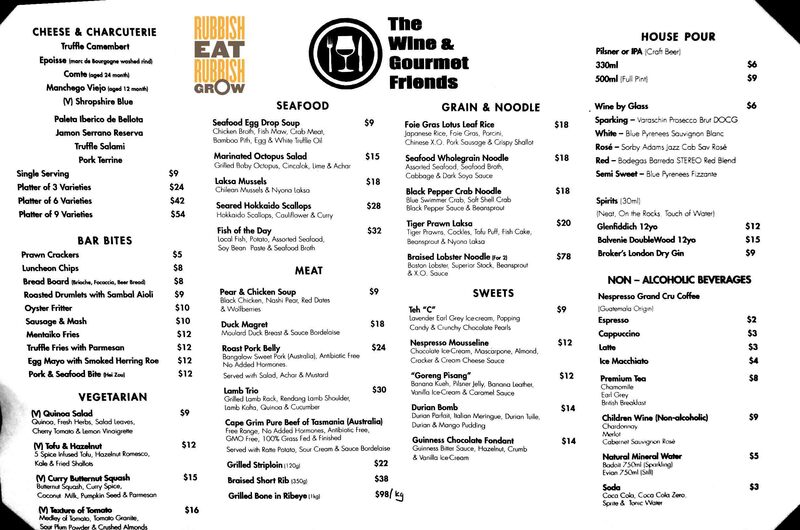 To sum up, The Wine and Gourmet Friends hosts quite an extensive selection of delectable dishes and wine with a welcoming, feel-good environment.